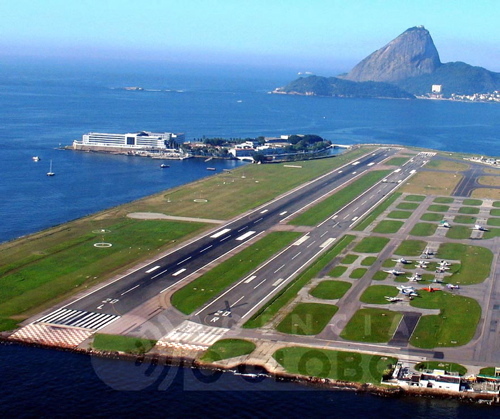 While sitting in the Panama City airport, waiting for my flight to Rio, one of Copa Airline’s Panamanian employees came on the intercom to announce that the flight to “Rrrrio de Haneiro” would be boarding soon. The long rolled R caused several of the Brazilians around me to turn to each other and chuckle. Later, while waiting to take off, the Brazilian flight crew announced that the trip to “Hiu gee Zhaneiru” would take about 7 hours. Nothing could better highlight the stark differences in pronunciation between Portuguese and Spanish, and nowhere is this more apparent than in the sound of R. A flight like this might be one of the first situations in which many tourists encounter the beautiful, enigmatic Portuguese R.
As with many languages, R in Portuguese can take on a kaleidoscope of different sounds depending on its placement within a word and the dialect of the speaker. It’s pretty much impossible to give any hard and fast rules that apply across all dialects. But I’m going to try here to give you a sense of the huge variation that exists. Ok, let’s just consider for a moment how weird and cool R is. Linguists have a special name for all the R sounds of the world: rhotics, which are a rather elusive category because there is no definitive phonological way to define what is and isn’t a rhotic — there’s not a single trait that all rhotic sounds have in common, except for some kind of association with the letter R in one or more languages. A sound represented by the letter R in one language could be represented by a completely different letter in another language, or it could be missing from that other language altogether. R sounds are fascinating to me not just because they are so diverse, but because they are one of the strongest markers of regional dialect, native vs non-native accent, and social class within any single language (consider a posh Queen’s English “yahd” vs. a nasal midwestern American “yard” vs. a rolling Scottish “yarrrd”). If you’re really interested in the mysteries of rhotics (and man, who isn’t? ), I encourage you to check out the Wikipedia articles on Rhotic Consonants and Gutteral R. The latter includes an excellent discussion of R in Portuguese and how it has varied across time and place. And these two wonderful episodes of the podcast Tá Falado are all about variations in the Brazilian R, letting you hear how three very different speakers from Pernambuco, São Paulo, and Rio pronounce their R’s. Before we get into Portuguese specifically, let’s talk about a few of the diverse ways R can be pronounced in European languages. Learning a bit about what distinguishes these sounds, and what your tongue and vocal cords are doing when they pronounce them, can help you with your pronunciation in all kinds of languages. I’ll be using symbols from the International Phonetic Alphabet to unambiguously refer to each sound, since some of the names I give the sounds are my own invention and not widely used. I’ll use [square brackets] to indicate sounds using IPA symbols. Later on, I will use <angle brackets> to indicate phonemes — that is, where the letter r comes in a word. We’ll then discuss how the sound used for each phoneme can be different in different parts of the lusophone world. The common midwestern R, used pretty much exclusively by Americans. Linguists call this a voiced alveolar approximant or a retroflex R because the mid part of the tongue rises up to approach (but does not actually touch) the alveolar ridge — that bumpy part on the roof of your mouth. Meanwhile, the lips are rounded into an O shape, and the vocal cords are vibrating. This is a rather difficult consonant for non-native speakers to achieve; Americans, on the other hand, may need to train themselves to not make this sound, because nothing makes you sound like an American like an alveolar approximant. This is known as the “rolling r” or voiced alveolar trill. The tip of the tongue is placed near the alveolar ridge and air is directed over it so it vibrates. Meanwhile, the lips are neutral and the vocal cords vibrate. It’s a sound found in dozens of languages, but most famously in Spanish, Italian, and Scots English. This sound, used in dozens of languages from Spanish to Turkish to Japanese, is called a voiced alveolar tap or flap. It’s very similar to the rolling R, except that the tip of the tongue taps the alveolar ridge just one time, very quickly, instead of a sustained roll. This is the other common R sound in Spanish, and it’s one that you’ll need to be very comfortable with in order to speak Portuguese. This video shows the difference between the three alveolar R sounds: the approximant, the trill, and the tap. This is the classic French/German R which has challenged many an English speaker attempting to find their way to a restaurant in Paris. Unlike the three alveolar R’s we’ve covered above, this R is a thick sound produced in the back of the throat. Linguists call it a voiced uvular fricative. The tongue is pulled down and back toward the uvula, the mouth is very open compared to an American R, and the vocal cords are vibrating. What comes out is sometimes described as a gargling sound. This video gives an example. The [h] sound is just that, a normal English h in words like hello and hope. [χ] is a thicker “hissing cat” sound, identical to the h in English human, humid, hue, hew. It’s kind of like an h and a y sound put together. English speakers make this sound all the time, but because we only pronounce it when we see the letters “hu” or “pu”, it can be confusing to encounter it in other contexts – say, at the start of a word like Rio. The third sound [x] isn’t found in English, but many English speakers are familiar with this sound from common words in other languages. The difference between the velar [x] and uvular [χ] fricatives is subtle. Both are represented in most languages (not Portuguese) by the letters ch or x. But the uvular fricative [χ] is a very smooth sound, just as smooth as [f] or [s], like the ch in German ich. It’s the sound you make to imitate a hissing cat. The velar fricative [x], on the other hand, sounds more rough, scratchy or gargle-y, like the ch in Hebrew Channukah, the ch in Welsh achos, ch in Scots loch, the x in Russian хороший or the x in Greek xi. You can also think of [x] as the unvoiced version of the French Gutteral R. For example, compare French restaurant and Portuguese restaurante on Forvo. Or listen to how Gal Costa pronounces Rio, morrendo, Redentor with [χ] in Samba do Avião, but João Gilberto uses [x]. Anyway, the important thing to know is that you don’t necessarily need to be able to hear the difference between the three unvoiced gutteral Rs, because all three are interchangeable in Portuguese — none is more right than the others. Finally, some speakers may just drop their R’s altogether, as in the British English pronunciation of “yard” [yahd] or a Bostoner saying “car” [ka:h]. This is a defining characteristic of British/Australian English as well as the New England dialect in the U.S. — so characteristic that linguists call these the non-rhotic dialects of English. While these speakers don’t pronounce the R in certain situations, they usually do lengthen the preceding vowel “the caah is in the yaahd” or insert a very slight h sound in place of the R. French speakers also drop their R’s in certain circumstances, often at the end of a word like regarder. Brazilians may also drop R’s when they come at the end of an infinitive like falar. By now you may be wondering which of these apply to Portuguese. The answer? Yup. Depending on where you go in the lusophone world, you can find Portuguese speakers pronouncing their R’s in just about any way imaginable. What this means for Portuguese learners is that there is no wrong way to pronounce an R, as long as you stick to a few simple rules which I’m about to go over. You can choose based on which sound is easiest for you to produce, which is most euphonious to your ear, which dialect your tutor or spouse or friend speaks, or which country or region you’re going to visit. I’ll give some broad generalizations below about which parts of the lusophone world use which types of R.
Which sound is used for R depends on where the letter R falls in a word. This is the idea behind phonemes. Here is where I’m going to start using <angle brackets> to indicate phonemes, but remember, this is just another way of indicating where the letter R appears in a word. Phonemes are a way of saying, If you see a letter “r” is this situation, use Sound A for it. If you see “r” in this other situation, use a different Sound B for it. But Sound A and B are not fixed — they will vary depending on the specific dialect. For example, both the letter “r” in rio and in garrafa represent the <rr> phoneme. The letter “r” in barato, on the other hand, represents the <r> phoneme. Depending on where you go in the Portuguese-speaking world, different people will use different sounds for the <rr> phoneme. But whatever sound they use, it will be different from the sound they use for the <r> phoneme. If you speak Spanish, you’ll see that the usage of <rr> vs <r> in Portuguese exactly parallels the situations when you would and would not roll your R’s. When it comes to <r>, all Portuguese speakers all over the world are in agreement: use a Tap [ɾ]. It’s exactly the same sound as the r in Spanish words like barato, corona, and cristo. Your tongue should tap the roof of your mouth just once, very lightly — but you should not roll or trill the r.
whenever it appears at the beginning of a syllable, after a consonant (honrar, Israel) — this doesn’t happen too often in Portuguese. These are the same situations in which Spanish speakers use a Rolling R.
When it comes to <rr>, Portuguese speakers cannot agree at all — there is no single sound that everyone uses. How a speaker actually pronounces <rr> varies widely depending on the dialect, the region of the world, and the idiosyncrasies of the speaker. Cariocas will use a thick gutteral [χ], gaúchos from the south will roll it [r], and European Portuguese speakers will use a very French/German sounding [ʁ]. If I had to guess, I would say [χ] (the hissing cat sound) is the most standardized. The last phoneme is used when R appears at the end of a syllable (corpo, parte, quarto) or the end of a word (falar, doutor). Here too there is great variety. Some Portuguese speakers pronounce it as [ɾ]; others (cariocas for example) pronounce it as a light [h] or a thick [χ]; still others (paulistanos and caipiras) will actually use a nasal American R sound [ɹ]; and others will drop it entirely — a Silent R! Unless you’re going for a paulistano/caipira accent, a good suggestion is that this sound should be lighter than the <rr> phoneme. Just to make things a little more complicated, it’s good to remind ourselves that words are rarely found in isolation, but usually appear between other words. <-r> can turn into <r> when it’s followed by a word that starts with a vowel, as in ligar o computador. Then it’s as if that final R in ligar falls in between two vowels, as in ligarocomputador, so you would use a flap. This tends to happen naturally when speaking at a normal pace, so it’s not something to worry about. The most common Brazilian pronunciation of <rr> and <-r> is the Voiceless Gutteral R: [χ], [x], or [h]. If you’re doing something along these lines you really can’t go wrong in Brazil. These three sounds are pretty similar in practice; the only difference is how heavy or thick they sound. My own <rr>’s alternate fairly indiscriminately between these three, though I usually opt for a heavier, more velar [x] at the beginning of a word like Rio, a lighter uvular [χ] at the end of a syllable like corpo, and a very light [h] or [χ] at the end of a word like falar. Many Brazilians pronounce the -ar, -er, -ir endings of verb infinitives extremely lightly, to the point where the Rs are only barely discernable or disappear entirely (falar = “falaah” or even just “fala“). Others, like cariocas, put a thick [χ] sound on the end. My advice, then, is to choose the dialect and accent you want to learn, and listen to how speakers with that accent pronounce their Rs. For example, on Forvo you can listen to how a few dozen Brazilians pronounce the initial R in Rio de Janeiro. (While you’re listening, notice too that some palatalize the de and others don’t). But don’t sweat it too much: no matter which R you say, you’ll be understood just fine all across Brazil. Residents of Rio (cariocas) speak a very distinctive dialect, which is also called carioca. Aside from abundant palatalization and vowel raising (de > gee), epenthetic vowels (mas > maish) and a lisping chiado (duas copas > duashh copashh), a defining aspect is the use of a very thick velar [x] or uvular [χ] for all <rr> and <-r> phonemes, including and especially those in the middle and end of a word. So corpo becomes “cohhpu”, falar becomes “falachh“. The distinction between <r> and <rr>/<-r> in carioca Portuguese is dramatic. To hear the difference, listen to quatro (<r>) and then quarto (<-r>). On the other hand, <rr> and <-r> are pretty much indistinguishable in this dialect. Semántica’s videos are a great place to hear this accent since they film in Rio with carioca actors. The residents of the rural, hilly interior areas of central Brazil speak with what is known as a caipira accent, which best translates to English as “hillbilly”. This accent is unmistakable because of the use of the alveolar approximant [ɹ], aka the American English R, for <-r> (but not <rr>!) phonemes. This sound will only happen at the end of a syllable (corpo) or the end of a word (condutor, tocar). Residents of São Paulo state have their own variation, the paulistano accent, which takes this to an extreme, with a sonorous nasal R — it sounds a little comical to my ear. For a fantastic example of this accent, listen to Michelle, who is from São Paulo state, speaking in this Tá Falado podcast. <rr> is pronounced [h] or [χ] as in most of Brazil. The farther south you go in Brazil, the more the local dialect tends to resemble Spanish. I’m not sure of the exact reasons for this, but my guess is it has something to do with the fact that Brazil has always had strong trade connections with the Spanish-speaking countries of Uruguay, Argentina and Paraguay along it’s southern border, whereas the other parts of Brazil are very isolated from their Spanish speaking neighbors. In Brazil’s southern states of Rio Grande do Sul, Santa Catarina and Paraná, where many German and Italian immigrants to Brazil settled and cattle ranching (pecuária) dominates the economy, people speak with a dialect known as gaúcho [ga’ushu] (cowboy). This dialect is defined, in part, by the use of the Spanish Rolling R (alveolar trill) for the <rr> phoneme. You’re most likely to hear the Rolling R at the beginning of a word like Rio, whereas <-r> phonemes that come in the middle or at the end of a word (parque, falar) are often pronounced as a Tap, just like the <r> phoneme. Residents of the mountainous state of Minas Gerais speak a choppy dialect marked by distinctive vocabulary and clipped words. They’ll often just drop the <-r> entirely from the ends of words (falar > fala). Take this with a grain of salt, because I am not as familiar with the European dialect. But as I understand it, the most common pronunciation of <rr>, at least in the metropolitan areas in the south of Portugal, is a voiced uvular fricative [ʁ] like the French Guttural R. Listen to this speaker from Portugal pronounce Rio – I think he might even be using an uvular trill [ʀ]. In more rural parts of Portugal, especially the north, the Rolling R/alveolar trill [r] is used, which parallels the use of the trill in the neighboring Galician-speaking parts of Spain. In all areas, R appearing at the end of a syllable, before a consonant (corpo, parque) is pronounced with a Tap. Listen to this Galician speaker pronouncing Rio. <-r> = (?) <- maybe a reader can fill me in here! I confess I know next to nothing about usage in Angola, Mozambique, Cabo Verde, Guinea-Bissau and São Tome e Príncipe. But if you believe wikipedia, this is the situation: Since luso Africa was colonized by the Portuguese in the 1500-1700s, the older continental pronunciation dominates: a voiced alveolar trill [r] like the Spanish Rolling R.
Hi Lauren, thanks for a very detailed explanation of Portuguese ‘r’ sounds. I’m actually in the process of writing a paper for a Phonology class, so I came across this website and it has been truly helpful. I’ll make sure to add a note acknowledging your input. I would just like to make an observation about Michele’s ‘rr’ in ‘garrafa’ or ‘arroz’. Those are pronounced like the initial ‘r’s as well, instead of a retroflex ‘r’ like her final syllable ‘r’s. I don’t think any Portuguese speakers use a retroflex ‘r’ (aka the American English ‘r’) for ‘rr’s, but the caipira dialect does surface in final position as long as it’s not connected to a vowel (dividiraconta) vs (dividir). Thank you Tammer, your observation certainly complicates the idea that there are only two (r, rr) phonemes in Portuguese… as you point out, Michele seems to use three articulations: retroflex, flap, and gutteral R depending on the position in a word, using the retroflex only at the end of a word. Perhaps R at the end of a word constitutes a third phoneme in her dialect? I don’t know enough about phonology to do more than speculate. In any case, thank you for sending your thoughts, they will help me improve this page! I pronounce tap, h, American. In Piracicaba, all of the phonemes are pronounced as the American one, including the (see watch?v=aL9Svopl6bc on youtube – “Rede TV – Piracicaba – Sotaque”). This article just blew my mind! I am from India but live in the US and I have a love for the Romance languages. I love the way you explained the 6 R’s coz I think like that too :) I was unsure which R to use for Portuguese because I have visited Portugal but also heard Brazilians in the US so was especially confused with the “rr”. I speak French and Spanish and my native language is Hindi, so I had an array of R’s available, just couldn’t figure out which one :) If this doesn’t creep you out, can we be penpals? I want to be able to talk to someone about nerdy stuff like phonetics every now and then lol. Great article and very interesting! I’m glad you highlited that in the south of the country some people roll the R’s the “spanish way”. I learned Brazilian Portuguese as a second language from aunts and uncles who were born and raised in Curitiba, Parana. While my aunts and uncles rolled their R’s in that same Spanish style, their kids and younger generations don’t do that anymore. It almost seems like it is out of style or something. I used to think that it was all regional, but now i’m convinced there is something to do with the time period as well. For instance, many musical artists from years ago (regardless of being from Rio de Janeiro, Minas, Sao Paulo or the south) rolled their R’s as you would in Spanish. I’ve put some examples below. My question is, what changed / why did it change and when did the “H – sounding” R begin to take over? I think the links didn’t work in my main post – you may have to cut and paste these into your web browser if you’re interested to see examples of what I described. Thanks, Nick, I came to this entry trying to find out the same thing about rolled Rs in songs. I was listening to Elis Regina singing “Águas de Março” and was trying to understand the sounds at the beginning of her Rs. They are H’s but they have an R-ness to them. Excellent! Your remarks are to the point, well written and very useful, especially for teachers of both languages. However, it seems to me that the question is not exactly the realization of [h] as [hyu] and [p] as [pyu]. The point here, I think, is the difference between the pronunciation of “u” in British and in American English (but the pronunciation of h is the same in both varieties). Does it make sense to you? Let me know. Oi E.R., I think that phonetically, you are correct in that it is the [u] sound itself which is modified by a preceding [j] glide when it comes after a [p], [h] (and I forgot to add [m] as in “mutate”, “music”, [k] as in “cute”, and [f] as in “future” though not “food” — it only happens to the letter ). *But* – this does not happen to [u] when it follows other consonants. For example, “tutor”, “dude”, “June”, “lunar”, “numeral”, “super”, “rude”. So I don’t think it is intrinsic to the [u] sound in English. – “comer”, “amar”, “ouvir” – you don’t even have to pronounce it (most people don’t), sometimes you’ll hear just a little stretch of the final vowel, but not “r”. Obrigada Claudia pelas suas dicas! Love this article, it’s huge fun. I also love the lessons’discussions on Ta Falado–especially Michele’s accent. I am learning Portuguese, and love the carioca dialect most, but also enjoy hearing the American-like “hillbilly” R of Piracicaba, (I think it is). The problem for me is, how do I get lessons in the dialects I want to speak? In Africa it varies slightly depending on the region. In Angola and Cape Verde they imitate the European pronunciation, although this could be different depending on the level of education or whether the person is a native Portuguese speaker or not…Cape Verdian Creole for example seems to trill the “r” or do the alveolar tap, but not so when speaking “proper” portuguese. I am much more familiar with Mozambique though…In mozambique the general rule is trilled and tapped r’s. There are so many non native speakers in Mozambique that you see some interesting influences from the african languages, especially among the less educated. For example they often add an “ee” sound to the final “r” and the final “l”. so “pedir” becomes “pediree”. Also in some areas you will hear people mix up the tapped “r” and “l” so quarta-feira becomes “qualta- feira” and coca-cola “coca- cora”. Fantastic. Thanks Preston for giving us an African perspective on Portuguese R’s! This is just a minor (and pedantic) correction. In English, the initial phoneme in words such as “huge”, “human”, “hew”, “hue” is actually a voiceless palatal fricative [ç]. As far as I am aware, the voiceless uvular fricative [χ] does not occur in English. Thanks for the correction Bryce! Is it weird if I do it this way? If I speak to a Brazilian or to a person from Portugal in this manner, will they find it unusual? Hi Daniel, you will be understood very well however you pronounce your R’s. People may just hear it as a Spanish or Southern Brazilian accent if you roll your R’s a lot. Sorry for commenting again, but I just wanted to know, do Brazilians think the South Brazilian accent is pleasing to hear? I’m a Brazilian from Rio de Janeiro and overall, I would answer ‘yes’ to your question. I mean, I guess that most Brazilians would be intrigued by a ‘gringo’ not using the more common carioca accent (by common I mean that most foreigners visit only Rio and therefore that’s the accent they probably pick up). Also, there isn’t a history of any sort of prejudice against southerners that I can tell of (unlike what happens with people from the northeast) so it definitely wouldn’t be frowned upon. This is wonderful, and much more thorough and technical than what I expected to find when I googled “brazilian portuguese r pronunciation” (I guess those phonetics lessons won’t go to waste after all ^^). Obrigado! Note that Brazil has the biggest Italian descent population in the world outside Italy – even bigger than the US. This population concentrated around the Southeast and South, exactly the places where the R is trill. Up to the 60s it was mandatory to use the R-trill if you wanted to speak on radio or sing to an educated audience. I even got some exercises like “O Rrrato Rrrroeu a rrroupa do rrrei de Rrrroma”. I never ever could do it. But it was considered upscale and educated. Around the 70s it lost its aura and became demode’. “Standard Brazilian” as reporters speak in national TV is the one spoken in Maranhao, Espirito Santo and to some extent Sao Paulo. This “standard” precludes the use of the R-trill, the American R and most importantly the “s” as “sh” as pronounced in Rio de Janeiro. The charged “sh” sound pronounced by a non-carioca btw is considered pedantic. As a foreigner, doing one of these sounds will raise eyebrows or perhaps an spontaneous laugh. My advice, stick with the tap-R and the voiceless palatal fricative (as in huge). Thanks so much for your perspective Henrique! It’s very interesting how different dialects have fallen in and out of fashion over time. So interesting. I came across this while comparing English and Portuguese phonemes. The only thing is, no matter how good the explanation, I cannot trill an R. I’ve lived in Portugal for years, speak Portuguese fluently, but the big difficulty I have in pronunciation is with the Rs. My Portuguese children and friends think it is hilarious. At best, my Rs sound like water going down the plug hole, at worst, like wodger wabbit. About the Southern dialects: the region was colonized by Spain and then stole by Moortugal and Brazil. Primeiro, preciso dizer que aprendi a falar o português em São José do Rio Preto, SP. Nessa cidade, o sotaque caipira é muito comum. Falo a lengua fluentemente, e já quando eu for pra São Paulo, ou então pro Rio, todo mundo faz comentários quando ouça os meus Rs! Eu acho o sotaque bonito, mas tem gente que não pensa igual.. de vez em quando conheço alguem que recomenda uma troca de sotaque. Por mim, o estudante de português deve continuar com o sotaque que gosta mais, e não se importa com as opiniões dos outros! Adoro esse site, continue o bom trabalho aí! Just wanted to note that it’s definitely not Gal Costa who sings Samba do Avião in the link; It’s actually Miúcha. Regarding the “American” r; it’s actually not used exclusively In American English. It’s also used in Ireland, Southwest England, and sometimes in Dutch, and is used in non-rhotic (typical British) English dialects before pronouncing a vowel. (Non-rhotic, “Typical British” English meaning as spoken in most parts of England, Australia, New Zealand, and South Africa, where they don’t pronounce the “r” before consonants or after vowels). I think I’ve figured out (for the most part) the different pronunciations of [r] in various word contexts by following the lyrics of Brazilian MPB along with the songs. I particularly like the Rio pronunciation. If I’m very focused, I won’t make any mistakes when reading a text, but it requires some effort. However, I believe it’s not necessary to force oneself to observe all those variations since some parts of Brazil use a simple Spanish-like [r] in all positions within the word, which is much easier to replicate for a foreigner that uses a similar type of [r] in his own language. It’s better to concentrate on the lexicon, morphology and syntax in the early stages of learning since other speakers will understand you without a perfect standard pronunciation on your part. However, if you get a chance to spend some extended time in Brazil (and most of us won’t), you will acquire the local dialect’s pronunciation by osmosis. I love that there are people in the world who share my interest in this arcane stuff. Oi! Achei muito interessante o teu blog! Queria te parabenizar pelo teu esforço e pela tua dedicação. Só uma coisinha, que não sei se alguém já mencionou, mas não pude ler todos os comentários :) O som do [χ] não existe em inglês. Mas existe sim no alemão padrão (Dach – [‘daχ]), em neerlandês (acht – [‘aχt]) e também no espanhol/castelhano do interior da Espanha (ojo – [‘o.χo]). O som que descreves pra “human”, etc. é [ç] (mesmo que na linguística inglesa não se transcreva [ç], mas [hj]; assim “human” é transcrito [hjuːmən], porém, o som é o mesmo), indéntico ao alemão em “ich” – [ɪç]. Abraços desde Hamburgo! Thanks for the very interesting article. I am both surprised and delighted that someone took the time. I’m from Bauru, at the center of São Paulo [which makes me a ‘caipira’], and we speak the ‘American r’ almost identically to them [although social-economic-culturally we cannot be confused with ‘hillbillies’]. I’d like to point out the existence of the city of Americana, near Piracicaba. Americana was founded by Confederate Americans, so they feel at home with the alveolar approximant. As for the Paulistanos, words like ‘porta’ and ‘corpo’, are some times spoken with the Tap, and other times with a rolling R. In recent times, Paulistanos are increasingly adopting the American R, like the rest of the state, especially the poorest people of the suburbs. I predict that the old Paulistano accent will be extinct in a couple of generations. Thanks for your excellent arcticle! I congratulate you for your detailed and careful study on Portuguese R’s. I have to say though you could have also written about Portuguese variations from Northeast and North regions. As a native speaker from South, I must say that they’re quite peculiar and representative Portuguese variations.